The area has a long and interesting history, including some fascinating shipwrecks, which you can discover on a series of shorewalks. SSCP is a great place to explore on foot, by bicycle or by canoe, particularly along the spectacular meanders of the Cuckmere River. The Visitor Centre is situated in an 18th century barn, and provides useful information on the Park with displays and exhibitions. There is also a shop with leaflets, maps and souvenirs on sale. Exceat Farmhouse Restaurant provides home baked fare of traditional and continental cuisine. The restaurant is open daily throughout the year and caters for individuals, groups, functions or business conferences. It has a beautiful walled garden that is ideal for wedding parties for up to 60 guests, telephone 01323 870218 for further details. 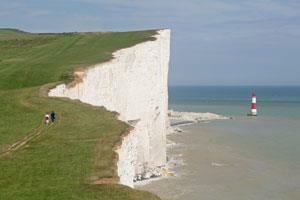 Seven Sisters Country Park is situated at Exceat in East Sussex, just off the A259 between Eastbourne and Seaford. It is easily accessible from anywhere in the South East but to preserve the unspoilt beauty of the South Downs we'd prefer you to leave your car at home. The park is well served by public transport. Buses 13 & 12 from Brighton/Eastbourne, and from further along the coast, stop at the Park entrance.